The bevelled photo folder is made from a high quality, heavyweight (1050 gsm) matt card with a heavyweight (850 gsm) backing board. 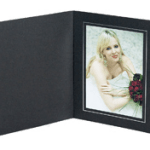 The folder is available in a black fresco colour with a white bevelled edge to the aperture, and can be purchased either in landscape or portrait format, with or without a protective polythene bag (please note that some larger sizes are not available with bags). Hover your mouse over the blocks below to get colour names for this product. Be the first to review “Bevelled Folder Mounts” Click here to cancel reply.